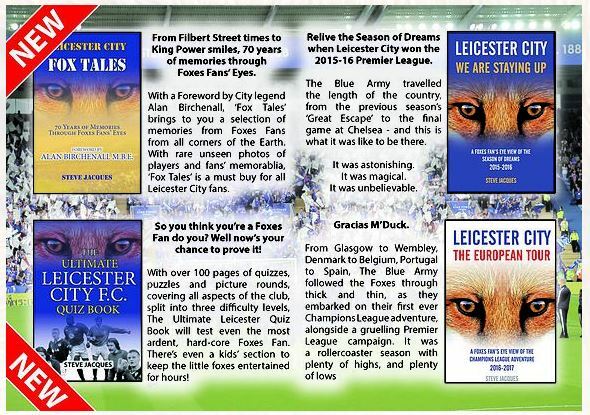 "Fox Tales" and "The Ultimate Leicester City Quiz Book" - is Leicestershire born and bred. Growing up, Steve fell in love with football from a very early age, thanks to his football mad family. His Grandad - Horace Jacques - was instrumental in building-up and establishing local non-league football club Enderby Town, as being the most successful non-league team in the county. His Father and Uncles also played their parts in the running of the club, with his Nanna and Mother also getting involved - washing the kit and running the canteen on match days respectively! From the age of 16, Steve played football every week, usually with his two elder brothers, across the city & county parks of Leicestershire, in the Leicester City League and Hinckley Sunday League. Starting off as a midfielder, before settling into his preferred role as a central defender (when his legs started to 'go'), it's no surprise that his favourite City player of all time, is Steve Walsh. ​"Steve Walsh epitomised everything that is needed in a great defender - tough tackling, great header of the ball, could read the game superbly - and he scored quite a few goals too. A real LCFC Legend. He truly was Fearless." Now fast approaching middle-aged ("already arrived there, years ago"), Steve watches the Foxes from the Kop, near to the Union FS crew in SK1...but prefers to sit down nowadays, as his knees are beginning to show signs of wear & tear, after 20 years of park football! Wondering what to buy the Foxes Fan in your life for Christmas? Well you could do a lot worse than Can't buy that feeling. 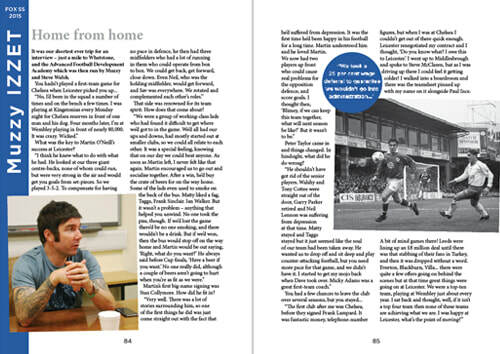 A collection of interviews with past Players, Managers and Chairmen once picked up you will find this hard to put down. Taken into the toilet for a quick read and break from the family, as men do, I emerged some 30 minutes later to the sound of banging on the door from the queue that had formed outside. Set out in Alphabetical order you find your self searching through for familiar names and when forced to put the book down to let others use the loo, walk out feeling a lot older from the memories than when you went in. This is a great read and like I said I was having trouble putting it down. A good addition to my LCFC reading library I would recommend this book without hesitation. three decades, building up a body of work that takes you right into the very fabric of the club, with memories spanning the last 60 years. 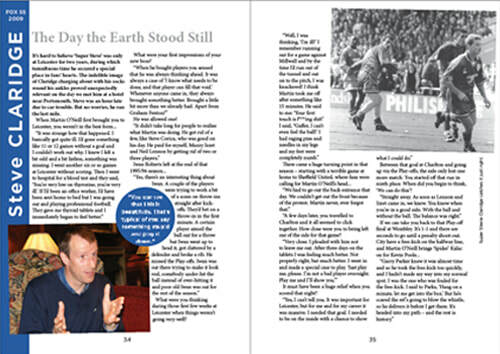 Read the best of The FOX interviews and you will discover how it feels to score a last-minute winner at Wembley. along with who bore the brunt of Stan Collymore’s fire extinguisher, how it feels to be a World Cup winner, and axed by Leicester City, which City star was run out of his local for moving to Leicester and the identity of the City player who chased members of the Chelsea team down the tunnel and much more. Discover players’ big-match memories along with their real opinions of their bosses, team-mates and fans. The book is available at the Foxes Fanstore, Waterstones and HMV in Leicester, plus online at Amazon, conkereditions.co.uk and ebay and makes the perfect Christmas present for Foxes fans whatever their age. Remember last season? Silly question of course you do. You will never forget those 38 matches that led us to be Premier League Champions, the first time Leicester City had been Champions of England in the long history. What a difference a season makes. But do you remember the 38 pre match manager press conferences? Well compare last season and the season before, the Great Escape Season. A lot of differences but probably the biggest was said managers press conferences. We had gone from Nigel Pearson's Ostriches to Claudio Ranieri's sharks, but coming from the mouth of this wily Italian you would rather face the sharks. The press turned up in the hoards under Nigel Pearson's reign unfortunately many to see which foot would be placed in which mouth that particular week. The same journo's came last season but this time to listen to the wit & wisdom of Leicester City's new manager. There are many youtube clips of Ranieri's utterings as Leicester manager, but this is just the tip of this Italian mountain. Who can forget - Yes, big revenge...i want to kill him! He's a nice man. It's just football. Uttered by Pearson THAT particular quote would have had the journo's diving for cover, said by Ranieri it was greeted with laughter, warmth & respect. Here for the first time is a mini guide to all the best Ranieri quotes over the years, not just as his time as manager of Leicester. Split into 10 sections with the 11th & final dedicated to what people have said about him, this is a humours guide guaranteed to bring a smile to your face. Priced at just £4.99 from Amazon this would make the IDEAL Christmas stocking filler for the Foxes Fan in your life and no you don't have to bury your head in the sand to find it, just click on the picture to the left order your copy gate the pizza in sit down & enjoy. I did! I have to start this review with a confession. - They say you should never judge a book by it's cover, but that is exactly what I did. From the author, Steve Jacques, first contacting me asking me to review the book to actually receiving the book & staring to read it had been a while. So I forgave myself for forgetting what the premise of this book was all about, but in hindsight that works in the books favour. The delay was down to Steve getting permission of certain parties to include pictures and text in his book. The fact that permission was finally granted is something we should all be grateful for as it is an amazing read. One mans thoughts of an amazing season and a bit that evoked memories that, lets be honest here, have never truly gone away. But back to my confession. I started to read this book thinking, as per the title, that it would be a review of the great escape season. That alone would live long on the memories of City fans everywhere, especially this one having to endure a 7 hour return trip every matchday to watch us lose, but I guess that is what a true fan does. But having started off with a brief history of how the author came to support the foxes ( we all have our own story there) it lands smack bang at the start of the great escape with the Hull match in March 2015. Cleverly thought out, the hairs will stand up on the back of your neck as you read match by match how the great escape came to be before the real reason behind the book, the epic Premier Laegue winning season of 2015/16. The book takes you on an emotional ride as it reviews every match and all the history Leicester City created last season. Yes it is a very personal view of the games written as Steve saw them, but then that's football isn't it? Reading the book I found myself disagreeing with some of Steve's man of the match awards but I couldn't disagree with the passion that comes through, showing the author to be a true Foxes Fan. The book ends with something for the stat lover that is in all of us football fans, as well as some interesting quotes from various football related people that will raise a smile or two. Whilst it is good to watch the dvd of the greatest season in our club's history, when a TV isn't available then this book more than fills that gap. Personally I will never be able to get enough of anything to do with last season, and who hasn't youtube'd Andrea Bocelli at the KP a few times? For me this is a great addition to my collection of memorabilia from last season, and I recommend that it should be added to yours as well. To purchase a copy of this book please click on the picture above. OK I am going to be upfront & honest here. 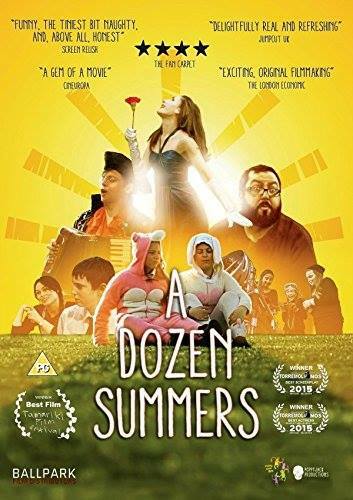 I was a bit wary when it came to reviewing A Dozen Summers. As a die hard Leicester City fan it was like being asked to review a Nottingham Forest game. A coming of age film is not exactly my favourite film genre but the lure of it being filmed in and around Leicester and trying to spot sights I knew as a lad was too much of a lure to refuse. Now here's the thing. There was very little of recognisable Leicester to see. No Clock Tower, no city centre, no Curve theatre, no Highcross shopping centre and certainly no King Power Stadium. But you know what, it didn't matter. Once you get into the film you forget to look for sights of Leicester you may recognise and just enjoy the film for what it is. But this is no Hollywood grab you by the heartstrings and get the Kleenex ready coming of age film, and for that I am glad. It is to Hollywood tear jerking kids films what The Full Monty was to Hollywood comedy drama. A down to earth independently made film to be enjoyed for what it is. The acting was not always of Oscar standards but for me that made it all the more real. We are expected to believe that is is being filmed as a semi documentary and the way it is acted makes this all the more believable. It avoids all the stereotypical twin and coming of age plots that you might expect from said Hollywood films. As a father of twin girls myself I could oh so empathise with the fact that the twins we complete opposites. Starting off with the unmistakable voice of ex Doctor Who Colin Baker, it features a cameo from the big bloke off The Office and a young lad who I had to pause the film and Google to satisfy my curiosity. (Yes he was off Britain's got Talent) . It is filled with great one liners that if you are not concentrating you may miss. It may not do a lot for onesie sales, but it is a film I would recommend you buy and enjoy with the family. A feel good films that actually makes you feel good. A down to earth film to be enjoyed on a wet cold winter Sunday afternoon with the kids. The problem you have when you are reviewing a book on what is your life outside your family is that quite often you know almost as much as the compiler of the book itself and you also notice more when a mistake occurs. So it was when I came to review the 'Football history as told through newspapers' of Leicester City. But lets go back to the start. Picking up the parcel on the way to work meant that opening it was done sat at my desk. With my boss away I knew I would have a few minutes to take a quick glance before having to concentrate on what i was employed to actually do. Having spent the last 12 month with me, my colleagues knew of my Leicester obsession and tended to ignore any sentence I uttered with the words Leicester City in. So as I quietly opened the parcel removed what is a tabloid sized tome and started to flick through the pages my concentration was such that I failed to notice the small crowd that had gathered behind me looking over my shoulder until the equally mad Manchester United fan exclaimed how good it was. The Manchester United fan is considering buying one for his young son, a history of the team his daddy, and the daddy hopes his son support. And that's the thing. This makes an ideal present for the, like me, aged fan who has followed the club for years or the new supporter that's looking for a potted history and judging by the reaction of the Liverpool and Spurs fan first impressions seemed pretty good. The Leicester City one starts in 1908 and runs right up to the Premier League winning newspaper pages of 17th May 2016. What you get here is, not, a lick your arse history of the club written by some over zealous fan, but actual newspaper reports written by (in Leicester City's case mainly Daily Mirror) journalists. Put aside your dislike of one newspaper or another and just immerse yourself into those stories you thought you had forgotten. They are all here warts and all. Well when I say all, here is the where the problems occur. Some years are completely missed out altogether, and some times you wonder if the right story had been chosen to be included. 1962 seems not to have existed and whilst it was great to read the report of Jamie Vardy matching the 10 goals in consecutive games of Rudd Van Nistelroy, surely the game where he beat the record should also have been included? You also have to allow for the fact that there are probably not as many records to pull up form the early 1900's. But I nick pick to be honest. Coming over quite dewy eyed as memories are stirred, not least seeing old newspaper adverts for cigarettes (was different days back then) you end up not only reading the bit about your team but other teams and sports that are reported on on the same page. Coming in either a Leatherette or a Luxury Leather cover in a choice of colours these can be personalised on the front cover and include a personalised message inside. Pages can be black & white or colour. With almost less than 20 weeks to go until Christmas, these books would make the perfect present for your football mad partner or child alike and a perfect keepsake for the future. Can't convince your partner to buy you one? Well starting from just £39.99 why not treat yourself. Just click on the large picture above to go direct to the website and order one today.